Cutting-edge science meets nature in Surface hair care. Featuring vegan Amaranth protein from Peru, along with an array of responsibly harvested botanicals, Surface Trinity Volume lets you make your hairstyle into a masterpiece. Like all Surface products, Trinity Volume products are designed to exacting scientific standards, featuring a balance of low molecular weight elements and high molecular weight elements. As a result, your hair will be protected and nourished, as the repairing elements penetrate the cortex to strengthen the cuticle. All Surface products feature the Color Vita Complex , Ceramide III, and vitamins A, C and E for the ultimate in antioxidant protection, and locked in protein and color. 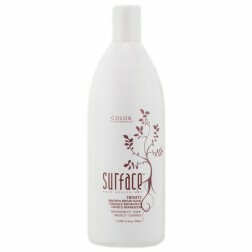 Surface Trinity Volume products produce full, voluptuous hair with brilliant luster. Use the shampoo and conditioner daily to gently cleanse and nourish while protecting from the weather, dryer or curling iron use. Repair and strengthen with Surface Trinity Protein Repair Tonic, Protein Cream, and One Shot Protein Repair. Surface Dry Shampoo gives you a quick and effective way to cleanse without water. The cleansing and conditioning products are all sulfate free, while the styling products have no plastics whatsoever. Surface Trinity Shampoo is the best of its kind, a strengthening shampoo that hydrates while it cleanses hair, adding moisture, volume and shine. You’ll get outstanding results in high or low humidity climates with this moisturizing shampoo that adds volume and health to your hair while protecting it from heat. If you blow dry or curl, the heat used will bind the Keravis and Amaranth into the cuticle, locking in the nutrients your hair needs. This shampoo is guaranteed to promote gorgeous, full-bodied volume. It’s sulfate free, and loaded with healthy nutrients that heal while you cleanse with its luxurious lather. It’s in a 10 ounce, 33 ounce, or one gallon bottle. Surface Trinity Conditioner helps you create lovely looks, with hair that gets healthier with each use. The blow dryer and curling iron are no match for this safe and effective strengthening conditioner, which adds volume with its powerful formula that’s built upon the best that science and nature have to offer. Organically produced Keravis and Amaranth infuse the hair with nutrients, penetrating the shaft and locking in the cuticle; heat only increases the nourishing and repairing effect. Surface Trinity Conditioner seals in color, adds shine, and enhances control, even in humid environments. It comes in a 6 ounce, 33 ounce, or one gallon bottle. You’ll depend on Surface Trinity Protein Repair Tonic to protect your hair while you step out into the elements. To protect from heat, wind and UV, simply spray and comb. You’ll get tons of control, in a formula that repairs, protects, and detangles. This healthy, effective hair tonic seals in color too. It comes in a 33 ounce bottle. Surface Trinity Dry Shampoo makes it easy to refresh your hair anytime. Whether you want to save time, or are looking to preserve your hair’s natural protein balance, this is an easy to apply, rub in and out that is 100 percent free of residue, to cleanse while enhancing color and luster. This innovative dry shampoo product from Surface also protects your hair while you’re out in the elements. Surface Trinity Protein Cream features the cutting edge science and hair design artistry that made Surface a household name. Using the same sustainably produced botanicals including Amaranth and Keravis, this healthy, effective cream delivers protein to the center of your hair’s cuticle, to seal in color, repair, strengthen and shine while masking split ends and eliminating breakage. Try Trinity Protein Cream for smoother, suppler hair. It’s available in a 4 ounce or 33 ounce bottle. Surface Trinity One Shot Protein Repair is a powerful tool to protect hair from the hazards of chemical treatments such as perms and colors. Simply apply before, during and after the treatment, to infuse the hair with nourishing proteins that penetrate the hairs’ center. Minimizing the effect of chemical treatments has never been so easy. It comes in a 0.75 bottle. Surface Smooth and Healthy Protein Smoothing Treatment is an alternative to Keratin-based hair products. Incorporating Surface innovations using natural proteins, Amaranth and Keravis, this healthy and effective hair repairing products strengthens and nourishes hair with protein, for healthy luxurious looks that last and last. You’ll get smoother hair that’s easy to manage even in humid environments. Styling time is reduced as the hair’s cuticle is locked in with nutrients that repel water. As a Keratin alternative, you can’t get any healthier or effective than Surface Smooth and Healthy Protein Smoothing Treatment.